You can access live data from the weather centre via a number of smartphone apps for both iPhone and Android devices. These apps are available for download free of charge using the links below. The mobile web interface is our most popular smartphone application. It features a very user friendly homepage with updated webcam image and links to current and recent weather data, graphical data, uv and solar radiation, grass and concrete temperatures, lightning information, station records, current rainfall radar, satellite images and charts. It is the only app that features the weather centre's own forecast. Data is supplied by both our Instromet and Davis weather stations. Type the following address into your Safari web browser - www.northantsweather.org/iPhone You can add an icon to the homepage by clicking 'Add to Home Screen'. The WeatherLink app connects with our Davis Vantage Pro 2 weather station and provides current weather data as well as highs and lows for the day, month and year. TempS1 relates to grass and TempS2 relates to concrete. Search for and add Pitsford Weather Centre once downloaded. The Pocket PWS is a very handy app for Android devices only and provides a quick summary of current weather data as well as the day's highs and lows. It connects with our Instromet weather station. Enter the following URL in settings: http://www.northantsweather.org/android/cumulus.xml once downloaded. Enter the station ID IPITSFOR2 once downloaded. PWS Weather Station Monitor is a popular app and provides current weather data as well as the day's highs and lows. It has the advantage over the WeatherLink app and Pocket PWS of being able to display graphical data. 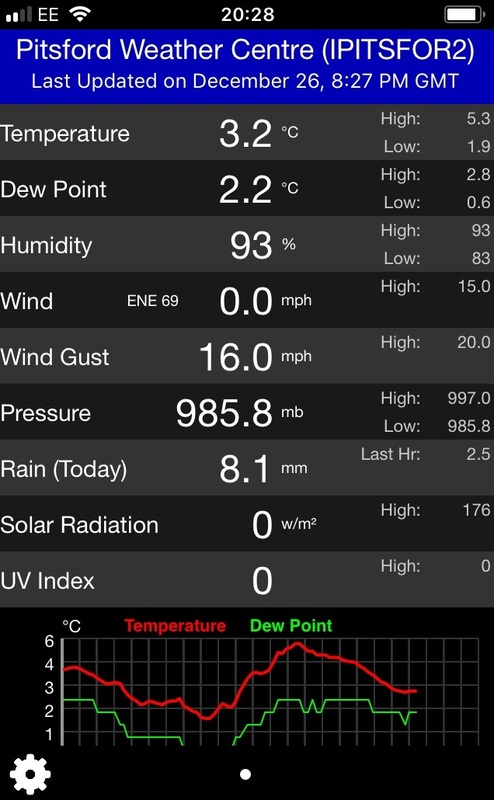 PWS Personal Weather Station monitor runs using data from our Davis Vantage Pro 2 station.